Being in Wittenberg you can tell it is a city full of ties, it is the center of something that changed the world nearly 500 years ago. Just walking through the Luther garden, it is evident the effects the reformation had. You can see trees being donated from churches in every corner of the world, all putting roots in Wittenberg. 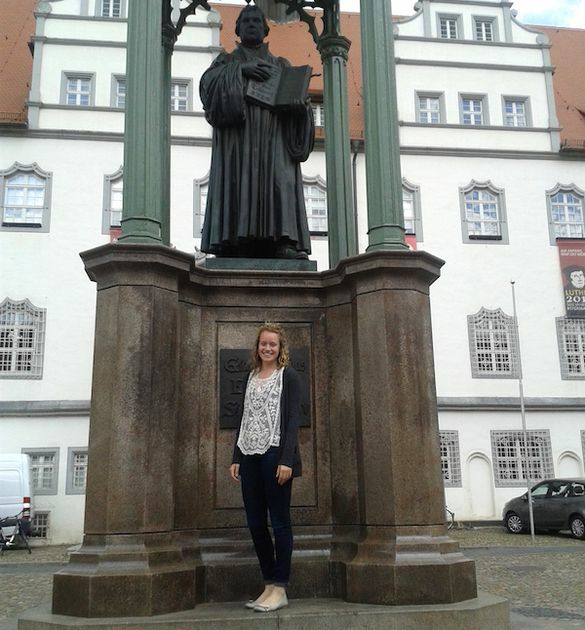 Growing up in the Lutheran Church Missouri Synod and now being a student at Wittenberg University in Springfield / Ohio, I always felt some connection towards Wittenberg. I had the opportunity to come with a group of students from Wittenberg University to study, intern, and experience life in Germany. What I previously knew about Wittenberg came out of history books. Actually being here, you can see the city is alive with history. Because Wittenberg became a central hub connected worldwide through the reformation, you can see and feel a sense of unity. The countdown for 2017 is on but everyone has been celebrating all along. The reformation is not just something we acknowledge every half a millennium. The religious, political, social, etc. effects have worked their way into our daily lives, not just in Germany but everywhere. Living here, I have met people traveling from all over the world who have been affected by the reformation just as I have been. During my time in Germany and with the “Luther 2017” governmental office, I have been able to be a part of the Luther decade and help plan for 2017. It has been an incredible experience to see how people are connected through history and are coming together to celebrate and remember the reformation.